As an idea, Both/And invites us to move beyond binary thinking. Dualities such as good/evil, us/them, male/female, future/past, chaos/order, composer/performer, and so on, limit us to a kind of disjunctive thought which can suffocate intuition and stifle imagination. Both/And implies what Carl Jung called “transcendent thinking”, which contains nuance, synthesis and the holding of (seeming) opposites. For example, Yin/Yang may at first appear as a simple duality, but upon deeper reflection is revealed to also be a kind of Both/And because each part contains qualities of its opposite. Both/And manifests too as Eshu/Elegba who sits at the crossroads and reminds us to look at a person or a thing from all sides before forming a general judgment or making a move. Significantly, the conjunctive thinking that infuses Both/And can open doors to the personal mysticism that frees and inspires creative imagination. When the drum strikes strong, you bend down. Composed in an Ostinato of Circularity of 33. Rhythm Call of 11 (Tolo*) played three times moving against a Signal Rhythm of 33 (Nya) played twice (4½, 5 ½, 6 ½ with 11 triplets). Each day dawns but once. 5 played seven times and 7 played five times yields the Signal Rhythm of 35. Triplets (Nya) move across the cycle three times to make the form of 105. Inspired by the North Indian Raga “Jog” (Sa, Ga, Ma, Pa, Ni, Sa) which is played from midnight to 3 am and expresses feelings of spiritual yearning. The call: Leaves shimmer and wave in the wind. A sonic fantasy with both composed and improvised materials conducted from “Tree” intervallic matrix (1, ½, mi3, 1, mi3, ½). Dance Drama Suite: During the tens of thousands of years that all human beings lived in Africa, music, dance and storytelling were one. Composed in an Ostinato of Circularity of 12 (Tolo/Nya) with rhythm modulations defining the form. Triple Diminished composition and matrix. The elders tell their story. An Ostinato of Circularity in 5. Reflective thought manifests as dialogic gestures spinning through a Triple-Diminished galaxy. Whirling spirits orbit to lift the moment. Composed in an Ostinato of Circularity of 54. 18 (Nya) moving against the Signal Rhythm (Tolo) of 27: 13 (2½, 3 ½, 3 ½, 3 ½) plus 14 (2 ½, 3 ½, 3 ½, 4½). Proverbs weave into a sonic fabric form of twelve tones. The response to the call is breath itself. A sonic fantasy conducted in the “Tree” matrix (composition for cello played by Greg Hefferman). There is a feeling of death with the end of each sound that implies transcendence. Based upon permutations of a Symmetric Hexatonic matrix. The second part becomes an Alap: A reminder that an ending is also a beginning. 1. Something within or from which something else originates, develops, or takes form. 2. A rectangular arrangement of elements into rows and columns. 3. The natural material in which something is embedded. Thanks to: Robert Browning, Bill Laswell, Lenny Seidman, C. Daniel Dawson, and Robert Farris Thompson. Both/And has been made possible with support from Chamber Music America’s commissioning program funded through the generosity of the Doris Duke Charitable Foundation. Both/And is dedicated to our dear families: Those here, those gone, and those still to come. Best New Releases, Album of the Year: ADAM RUDOLPH'S MOVING PICTURES - "BOTH/AND"
"A masterpiece. Truly. If you're looking for where jazz is heading, I urge you to take a listen to Adam Rudolph's Both/And." 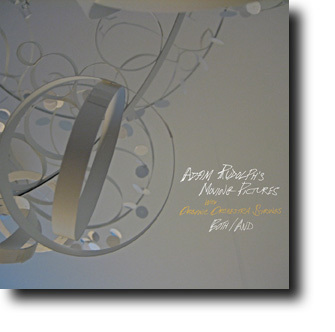 Top Ten CDs of 2011: ADAM RUDOLPH'S MOVING PICTURES - "BOTH/AND"
"Both/And is sumptuous, romantic, unpredictable and liberating." "First reaction: Perfect. Second reaction: Magnificent. Still on repeat .... Yeah!!!!!! Thank you Adam Rudolph." "An impressive new album, Both/And showcases Rudolph's colorful, deeply grooving compositions." "Smashing...Both/And is a whirlwind of sonorous sounds and good vibrations." The music of Adam Rudolph reveals itself like an excursion into an undiscovered country. Rudolph’s compositions create environments for musical invention, fertile soil from which sound carves out its own landscape. It’s a ritual space, hallowed ground for metaphysical exploration and exultation of the sonic urge, a spiritual celebration of music forever in the act of becoming. Stumbling into this imaginary clearing, the aural traveler might be astounded to find an idiosyncratic culture, at once familiar and exotic, primeval and advanced, cerebral and emotionally direct. The constantly transforming terrain can shift suddenly from Delta swampland to African veldt, from urban Chicago to rural India, conjured from Rudolph’s evocative, imagistic orchestration. Since 1992, the chief population of this self-defining vista has been Moving Pictures, an amorphous ensemble formed as a vehicle for exploring Rudolph’s rhythmic and intervallic concepts. Both/And, the ensemble’s sixth release, represents the culmination to date of the composer/percussionist’s ideas, an ideal commingling of personalities, instruments, craftsmanship and invention. As its title suggests, dichotomies coexist harmoniously within Rudoph’s music – composition and improvisation, intuitive and intellectual, past and future, east and west. All come together in the guise of an octet comprised of highly individual musicians uniting to form a collective voice. The unique circumstances of this recording represent a snapshot of its moment in the creative history of Rudolph and Moving Pictures, but the immediate moment is more than incidental; it’s the driving force behind Rudolph’s compositional philosophy. Among Rudolph’s primary strengths as a composer is his ability to devise pieces that speak in his own distinct voice while allowing each of the ensemble’s strongly individual instrumentalists the freedom to explore within their expansive boundaries. One model for this approach is Miles Davis, whose legendary ensembles forged unforgettable, groundbreaking music from savvy combinations of his era’s greatest musicians. Those two referents exemplify the diversity of Rudolph’s musical touchstones, which range from traditional to avant-garde jazz, to world music from across a range of cultures, to blues and psychedelic rock, to classical and new music. He would be quick to add “so-called” before each of those genre labels, which can be tenuous and limiting under the best of circumstances. Even a cursory listen to Rudolph’s music demonstrates just how useless they become in the face of truly open-minded creation. The album’s title track is an almost pure distillation of these ideas, a lovely, kaleidoscopic flow of colors and continuously-shifting combinations. Cornetist Graham Haynes and guitarist Kenny Wessel navigate waves of percussion, floating on airy tides at the outset, later to be swept up by more urgent currents. The actual voices of Moving Pictures are ever-changing, but the musicians in its current incarnation all have plenty of experience with the leader’s music. Haynes, Wessel, and oud player and percussionist Brahim Fribgane return from the band’s previous CD, Dream Garden. Trombonist Joseph Bowie and multi-reedist Ralph Jones go back much further, Jones as far as 1974 as one of Rudolph’s earliest collaborators. Much of the group has also performed with the Organic Orchestra, a 25-to-50-piece ensemble which operates by Rudolph’s unique method of conducted improvisation and is also the source of the eleven-piece string section that joins the octet on Both/And. Jones interacts with the string section on the two “Tree Line” pieces, both of which are composed using a matrix generated by Rudolph. These matrices, he explains, allows the musicians a greater range of melodic options while maintaining the composer’s emotional intent. As opposed to the traditional notation that moves from one note to the next in a preordained progression, Rudolph’s matrices offer multiple possibilities at each given juncture. As far-reaching and multi-faceted as his influences have become, however, their beginnings can be traced back to a very specific time and place – the south side of Chicago in the 1960s. It was there that the young percussionist’s ears were opened to the myriad sonic forms that personal expression could take. While his own approach to music-making has evolved considerably since that time, those earliest influences are still present in the music Rudolph composes for Moving Pictures, albeit filtered through his own progressive vision. “Blues in Orbit”, for instance, is somewhat self-explanatory in that it takes an expansive approach to the blues form. Its spiraling rhythms swirl those Chicago-born sounds together with Kongo and Bantu music into a thicket of circular momentum. As a teenager, Rudolph began playing hand drums in the streets and parks in the Chicago neighborhood of Hyde Park, but was soon playing with local legends like saxophonist Fred Anderson in Chicago and the Contemporary Jazz Quintet in Detroit. His nomadic instincts soon found him traveling further and further in a quest for new musical experiences, beginning with studies throughout West Africa in 1977. The following year, he co-founded The Mandingo Griot Society, fusing African and American music, with Gambian kora player Foday Musa Suso. He spent much of 1978 living in Don Cherry’s house in the Swedish countryside, where his own compositional vision began to cohere under Cherry’s tutelage. In the decades since, Rudolph has studied North Indian tabla, Balinese gamelan, and music from across the African diaspora. He has married American and Moroccan sounds with Gnawa sintir player and singer Hassan Hakmoun and soloed with symphony orchestras across the United States. What is unique about the outcome of his extensive studies and travels, however, is that they have congealed into a singular music beyond style or culture. Rudolph’s pieces are not jazz or avant-garde translations of the music from country “X”; they are new means of expression utilizing lessons and techniques imbibed from around the globe. The language is his, the accents multifarious. In the realm of creative improvised music, the necessarily broad term which he uses to describe his own endeavors, Rudolph has collaborated with the likes of Don Cherry, Pharaoh Sanders, Sam Rivers, Wadada Leo Smith, L. Shankar, Jon Hassell, and Omar Sosa, among a host of others. Perhaps the most important of his myriad musical relationships is the one he has shared with multi-instrumentalist Yusef Lateef for more than twenty years. Since 1988, the two have recorded more than fifteen albums together, including a pair of concertos that each wrote for the other, released on the album Toward the Unknown in celebration of Lateef’s 90th birthday in 2010. Technically, the album’s second track, “Love’s Light”, is a complex piece built on a 105-beat rhythm cycle and an Indian raga called Jog. But these are mere statistics, where the sound of “Love’s Light” is meditative, transcendent; it progresses as a slow blossoming, accumulating colors like a sunrise emerging over the horizon. Comments like these make Both/And and Rudolph’s work in general seem as much a spiritual rite as a collection of music. A longtime practitioner of Hatha Yoga, Rudolph sees music itself as a form of Yoga in its guise as a “unity of mind, body and spirit.” There is no separation, in his view, between the musical and the metaphysical. In this way, he follows the path forged by spiritually-oriented forebears like John Coltrane. The process of forging such a personal worldview, Rudolph says, travels through three phases, structured as three basic questions: What, How and Why. In a concrete sense, this is the path any musician takes from influence to expression, but alongside that development Rudolph traces a parallel spiritual progression. “Growing up, when a young musician is attracted to a particular music in their environment,” he says, “I call that the ‘What’. They’re called to it, they don’t know why, but they love it. However, in the process of developing oneself as a musician, we want to move from the ‘What’ into the ‘How’ – to learn how the music is constructed, to move beyond style into pure musical elements: melody, harmony, rhythm, intervals, and timbre. Rudolph’s ‘Why’ has absorbed the lessons of numerous teachers and cultures, emerging in echoes of the primal and constructions of advanced complexity, distinctive images and mystical abstractions.